As far as archaeologists can ascertain, the evolution of the great and ancient Peruvian civilizations was parallelled by the growth of amazingly similar civilizations in that part of Central America which is today known as Mexico. Although comparatively little is known about these civilizations, two facts are undisputable: both cultures produced extraordinarily massive and complex pyramidal structures, and both cultures relied heavily on astronomical calculations in the planning and erection of all of their architectural edifices. None of this would be very surprising except for the belief of archaeologists that both cultures were totally insular; it is contended that neither culture had even the slightest knowledge of the other. Meso- (or middle) American civilization cannot be traced much farther back than 1500 B.C. Known as the civilization of the Mayas, this culture has, due to its elaborate structure and great complexity, challenged the imagination of explorer and scholar alike. 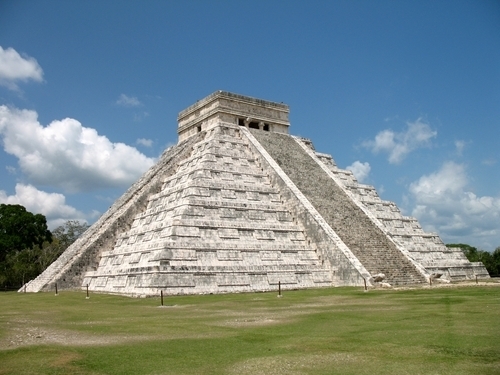 Mystics theorize that the Mayas originated from the lost continents of Atlantis and Mu. Less fancifully, archaeologists and historians consider the Americas to be the Mayan place of origin and credit these people with carrying to a higher degree a civilization shared by their neighbors. It is now believed that the earliest of the Mayan civilizations is that of the Olmecs, a people who lived and flourished in what is today known as southern Vera Cruz and Tabasco. Archaeological excavations at these sites have produced huge stone heads and religious and calendric formulae inscribed on stone stelae. The religious art of the Olmecs is notable for its portrayal of strange beings whose faces are either swollen and infantile or else grotesque visages of tiger-like monsters. The dominant religious figures of the Olmecs is depicted as an old man, usually portrayed in a sitting position with his head bowed. Supported on his head and shoulders is a bowl, possibly used for burning incense. This god was to be worshipped by successive Meso-American civilizations. The Aztecs, of whom we will speak later, called him Huehueteotl, the old god, or Xiuhtecuhtli, lord of fire. Since Xiuhtecuhtli’s worshippers dwelt in a volcanic region, this appellation was peculiarly appropriate. It has also been suggested that those who called him Huehueteotl identified him with the antiquity of the mountains in which they lived. Mexico. The mound is approximately 369 feet in diameter and has a wide ramp which soars sixty feet above the ground to the top of the structure. It is faced with river boulders, possibly to lessen the erosion of seasonal rains, or perhaps merely to enhance the effect of rugged majesty. The people of Cuicuilco built not a temple on the summit, but rather constructed a simple altar, exposed to both the elements and the eyes of the population. Because of its soft lines and the lack of sharp corners and angles, the mound seems to be the spontaneous evocation of an immense religious spirit. In direct contrast is the altar. It has rectilinear, sloping walls with a pair of steps with vase-shaped rail supports. The sides of the altar are adobe faced and smooth, resembling the plasterwork of architecture developed more fully in religious edifices built centuries later in other parts of the world. The people of Cuicuilco refurbished their religious building several times. Twice they replaced the altar by putting another one directly over the existing one. They even refaced the structure using sharp blocks of lava instead of the river boulders. The beginning of the disappearance of the Olmec civilization was marked by the eruption of the volcano, Xitli, covering the bottom third of the mound with lava. It would appear that after this event, the civilization ceased to flourish and, in time, disappeared. The Olmec civilization seems to have been paralleled by that of the Zapotecs, in the highlands of Oxaca, south-west of the Olmec country. Their art styles and writing were very different from that of the Olmecs. Calandric calculations were set forth in distinctive writing and their system fixed the date in terms of a fifty-two-year cycle. The Zapotecs were very advanced, as is evidenced by their chief ceremonial site at Monte Alban. This covers a small mountain which is levelled and terraced into a gigantic natural platform. This in turn supports buildings such as temples and ball courts. Like the Olmec, and other ancient American civilizations, the Zapotec civilization disappeared suddenly and inexplicably. In approximately 600 B.C., a majestic ceremonial civilization known as Teotihuacan emerged. Situated in the valley of Teotihuacan, it is traditionally known as the “place of the Gods.” In a vast area nearly 2 miles wide and 3 Vi miles long, an imposing cluster of buildings are grouped. The floor of this zone was plastered, not once but many times. Obviously, it was neither an ordinary city nor simply a religious center for temples and houses. The architects planned and constructed their metropolis in several successive precincts extending southwards from the mighty Pyramid of the Moon. This was not a true pyramid but was truncated at the top to house a pyramid, and the faces of the platform were skillfully designed to provide terraces. From a rectangular court, a broad staircase led up. the south side of the platform. Flanking the Plaza of the Moon were additional buildings; several hundred feet to the west and east, two smaller precincts added to the symmetry of the plan. Two impressive rows of buildings of great size lead south from the Moon Plaza. Excavations of one revealed the contents, suggesting that it might have been the Temple of Agriculture. Smaller clusters of mounds lie off to the east. Directly to the south is a large unexcavated group of buildings and temples, called the “Group of the Columns,” because of some artifacts found in the vicinity.